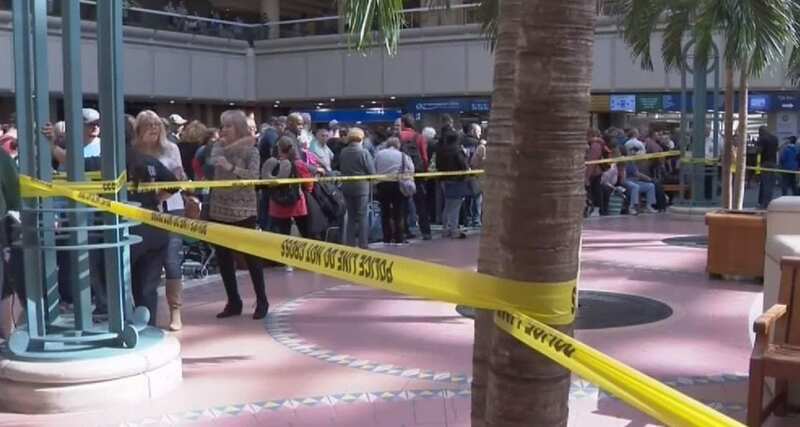 Today, Saturday, February 2 2019, Southwest Airlines canceled 49 inbound flights and 45 outbound flights, after a TSA officer jumped to his death inside Orlando International Airport at around 9:30 am ET. The Transportation Security Administration (TSA) agent jumped from a balcony inside Florida’s busiest airport. Passengers panicked, rushing past checkpoint, which caused security checkpoint closures and delays for up to 3 hours. The TSA officer was off-duty at the time of the incident when he fell from a hotel balcony inside the airport’s Hyatt Regency Hotel. He landed on the atrium floor in the main terminal that overlooks a security checkpoint. The Orlando Police stated that this was an isolated incident and appeared to be a suicide. The TSA officer was taken to a nearby hospital in critical condition where he was later pronounced dead. Those passengers who rushed past security checkpoints in the panic were re-examined for safety, and a security sweep of the affected gates and aircraft was conducted as well. All flight to and from the affected gates were halted until security measures were put back in place. Airlines affected by the stoppage included Alaska, Air Canada, Delta, and Southwest airlines.